If you're struggling with trying to get your cholesterol numbers down, you're not alone. Seventy-one million Americans have high LDL cholesterol, and only 1 out of every 3 have their condition under control, according to the Centers for Disease Control and Prevention. If you're looking for a delicious way to improve your numbers, consider adding nuts or seeds to your diet. Nuts and seeds, including pistachios, almonds, walnuts, flaxseeds and sesame seeds, contain nutrients and healthy fats that help lower cholesterol and improve heart health. If you're looking to jazz up the low-cholesterol diet your doctor has prescribed, consider adding pistachios to your diet. Pistachios are high in unsaturated fat, which may be what helps lower your numbers. 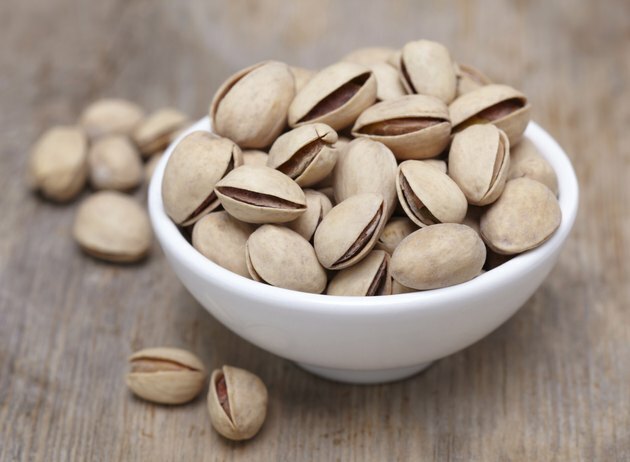 A study at Pennsylvania State University saw a significant drop in both total and LDL cholesterol in a group of people with high cholesterol after the group added 1.5 to 3 ounces of pistachios to their low-cholesterol diet. Pistachios are also rich in antioxidants, and the researchers found a reduction in inflammation and oxidation in the study group as well. Almonds contain a number of nutrients that are good for your heart, including unsaturated fats, fiber and phytosterols -- which are chemicals found in plant-foods that help lower blood cholesterol levels. Adding almonds to your diet also improves cholesterol levels by lowering LDL cholesterol. The heart-protecting nutrients found in almonds help prevent your body from absorbing cholesterol and assist with eliminating it. 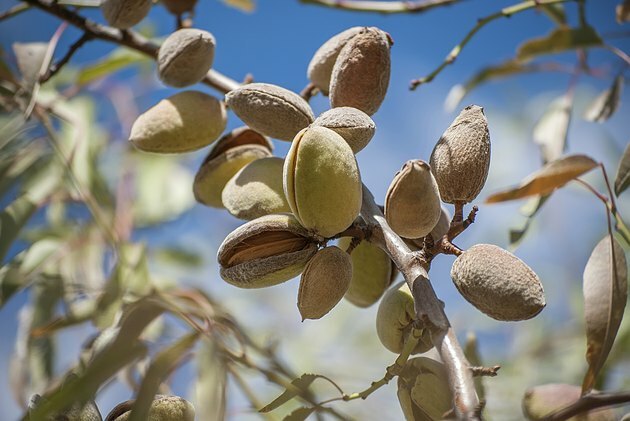 Almonds may also contain nutrients that play a role in regulating cholesterol production, according to researchers at The Pennsylvania State University. 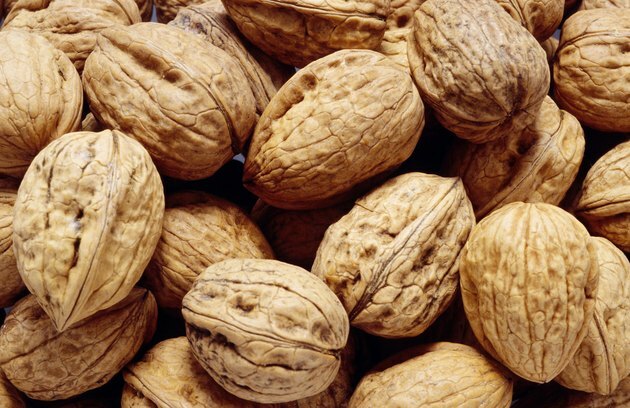 What separates walnuts from other nuts is their fat composition. Most nuts are high in monounsaturated fats, while walnuts are high in polyunsaturated fats, and more specifically omega-3 fatty acids, which are heart-healthy fats that help lower blood cholesterol levels. On average, eating a walnut-rich diet -- which is about 14 walnut halves a day -- can lower your total and LDL cholesterol by a few points. And like pistachios, antioxidants in walnuts also reduce inflammation. Adding 3 tablespoons of flaxseed to your diet may help lower blood cholesterol for men but not women, according to study from Iowa State University's Nutrition and Wellness Research Center. This study, which included more men than women, saw a 10 percent decrease in cholesterol levels in men, but no significant change in women, after they added 3 tablespoons of flaxseeds to their diet. 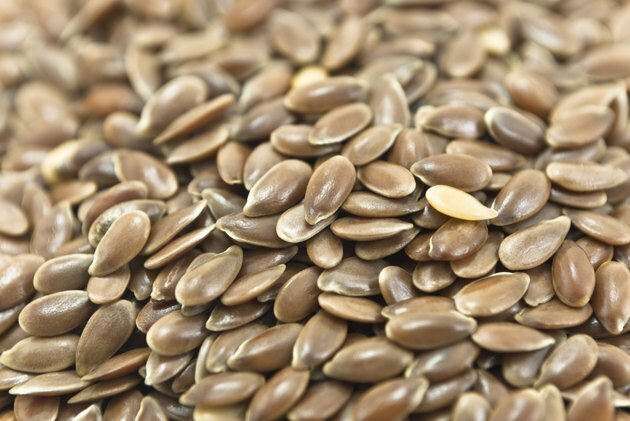 The heart-protective chemical compound lignan found in flaxseeds may be responsible for the cholesterol-lowering effects. 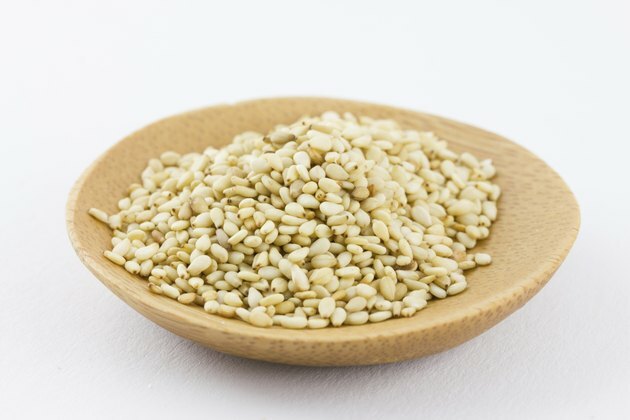 Sesame seeds contain lignans and phytosterols. In fact, sesame seeds contain higher amounts of phytosterols than any other food, according to chemists at Virginia Polytechnic Institute and State University. A 2005 study published in "Nutrition Research" found adding 1.5 ounces of sesame seeds to a low-cholesterol diet reduces total cholesterol by 6 percent and LDL cholesterol by almost 10 percent.